Fans of Lompoc beers will soon be seeing an updated look on store shelves and in bottle shops. Several of Lompoc's most popular beers are getting new labels. The common theme is that the Lompoc logo is taking a backseat to the beer's identify. I think it's a good change. 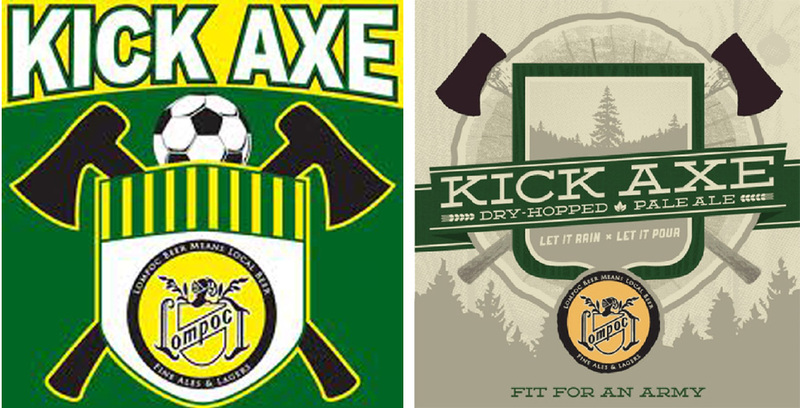 The first of the updates is to Kick Axe, the unofficial beer of the Portland Timbers. Kick Axe was launched about a year ago. It's a dry-hopped pale ale with many fans. The new label softens up the presentation while maintaining the basic notions of the original. Note the smaller Lompoc logo. 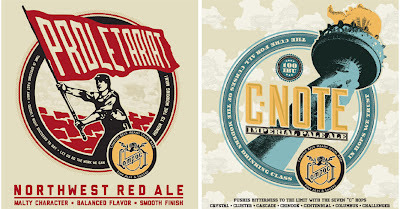 Proletariat Red and C-Note Imperial Pale Ale are also getting face-lifts. Proletariat Red is full-bodied with a rich red color. It's built a following on it's malty flavor and smooth finish. The new label projects the working class aspect of this beer. C-Note is a hoppy pale brewed with seven "C" hops. It packs IBUs to the limit at 100. Hopheads love it. 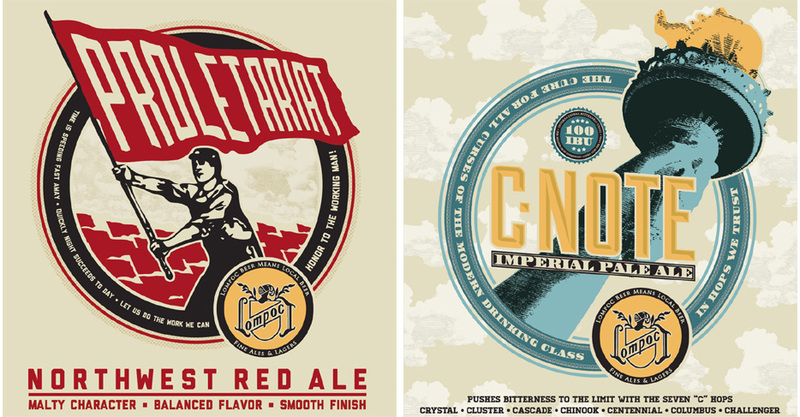 New Proletariat Red and C-Note bottles will start appearing on store shelves in a few weeks. Bottles of the new-look Kick Axe are already out there. Although I consider these changes to be fairly dramatic, there is apparently no plan to extend the revised look to the company as a whole. 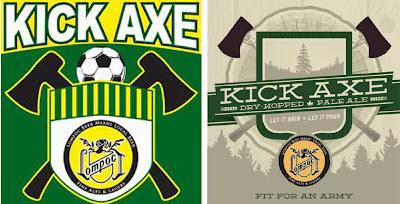 "When we decided to design a new label for Kick Axe, it seemed like this would be a perfect time [to update other labels], " Lompoc owner, Jerry Fechter, said. "We wanted to create a little bit of excitement in the Lompoc Brewing family. We will also be changing the LSD (Lompoc Special Draft) label in the fall. We feel these new labels help convey what each beer is about and what it represnts as a beer style." I approve of the new look. The retail bottle market is heating up dramatically and you need to have appealing labels to compete. I think the new Lompoc labels will help with that.